Tickets to my cruise are still available! Last year we had the most AMAZING time – I don’t know if the ocean “conducts” spirit messages, or it was just that that everyone was having such a blast that Spirit wanted to join the party! I’m pretty sure it was both. If you missed out last year, here’s your chance. Give yourself permission to be spontaneous, and join us February 24-March 3 for a wonderful 7 day cruise! We’ll be traveling from Fort Lauderdale, Florida to four wonderful destinations. Our first stop will take us to a private island, Half Moon Cay, Bahamas. The peace and solitude of Half Moon Cay will give you the chance to be still and listen to your inner voice and hear messages from your loved ones in Heaven. Our other destinations are Ocho Rios, Jamaica; Georgetown, Cayman Islands; and Cozumel, Mexico. There will be so many opportunities to connect with your loved ones as you enjoy these beautiful surroundings and the calm and tranquility of an ocean voyage. And there will be a lot of fun to be had on board too! You can almost be a different person on a cruise, leaving all your day to day responsibilities behind. Usually, you have to pack and unpack and lug all your belongings to your hotel room in each new destination. On a cruise, you take your hotel with you! It’s very freeing to just put your stuff down once, then have time to explore! A cruise can be the perfect opportunity to tune into your intuition and open yourself to signs and messages from the other side. 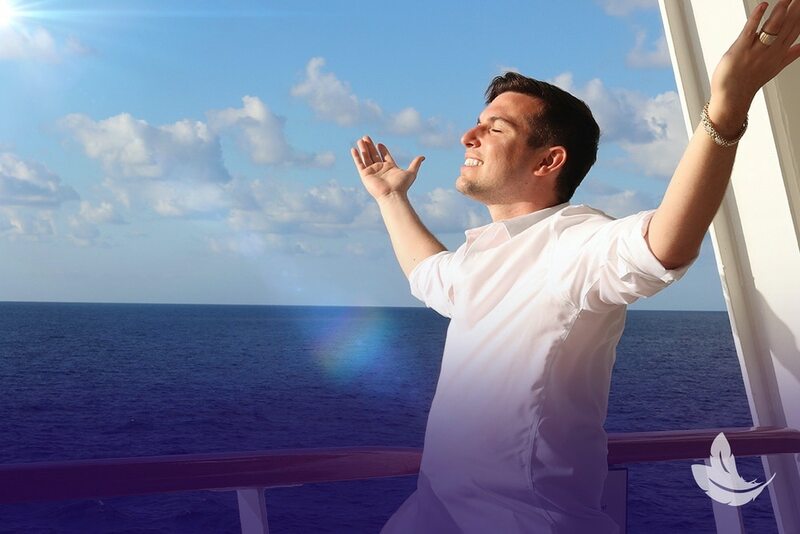 During the cruise, you’ll have the opportunity to attend an onboard class where I will be talking about how to connect with your own psychic voice. We’ll also have private group meetings. You can even join me for an optional private group excursion. There are more details on my website. I really hope you will join me for the terrific adventure! If you are hesitating because it seems like a lot of money, I want to share a story. A woman on last year’s cruise felt a little guilty for signing up. She felt like going on this cruise was too extravagant, that she was spending too much money and time on herself. She thought she was being selfish to go. During the cruise, her husband came through to her. He told her he was so happy she had made the decision to go. He had removed some obstacles to allow her to take the trip! He said that she had taken such good care of the family, and particularly of him when he was sick and dying, that he wanted her to heal on the cruise.Your loved ones want you to be happy…and they want to connect with you! Give yourself the gift of this experience. We had such a great time last year. I know this year’s cruise will be even better! Connect with your loved ones in heaven while you’re there – you’ll leave transformed, inside and out. To Attend, Please Call My Friend Wendy at Travel Store.